If you can’t remember what it’s like to wake up in the morning and read the time on your alarm clock without squinting and fumbling for your glasses, you may have given some thought to laser eye surgery. Glasses and contacts are wonderful and even fashionable; but they do require maintenance, cleaning, and frequent trips to the optometrist. Not to mention the cost of contact lenses, prescription renewals, or frame updates. Laser eye surgery can correct your vision and dramatically reduce your dependency on glasses or contacts. You can avoid spending time maintaining eyewear and can cut out long-term costs associated with using eyewear. Lavenburg Medical Group is here to help you decide if laser surgery is the right option for you and we are happy to answer all your questions. If you are a resident of Elkton, Newark, or the surrounding areas, our doctors can recommend the type of procedure that's best for you. Laser eye surgery can correct near and farsightedness, reduce astigmatism and bring your world back into focus naturally. If you have felt chained to your glasses or contacts, a corrective procedure may be a breath of fresh air that allows you to enjoy life in a new way. However, refractive surgery can’t stop the natural aging process of the eyes and its results don’t always last forever. The best way to understand what expectations to have for your individual results is to get a professional opinion. Our doctors at the Lavenburg Medical Group will assess your condition and make the best recommendation possible for all of your needs. LASIK surgery is the most popular form of refractive surgery today. 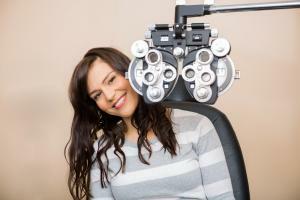 LASIK is primarily used to treat nearsightedness, farsightedness, and astigmatism by creating a small flap in the eye. The cornea is reshaped so the correct shaping is restored and light is able to enter into the eye properly. LASIK surgery takes less than 15 minutes per eye and requires no bandages or stitching. While you may experience some minor discomfort, most patients can return to work within a day or two after the procedure is complete. If your vision prescription has been stable for four to five years, you're between the ages of 25 and 45, and don't have complications such as cataracts or glaucoma, LASIK surgury may be a perfect option for you! Our doctors can perform a quick and easy consultation to determine if this procedure is right for you. Whether you're a candidate for LASIK or not, there are several other types of laser eye surgery that we offer that may be right for you. These include PRK and Advanced Surface Abrasion. Each procedure aims to reshape your eye to return clarity to your vision. All our corrective surgeries are in-office, out-patient procedures that have a short recovery time. Your consultation will be primarily focused on which treatment option with provide you with the best results. If you live in Elkton, Newark, or the surrounding areas, call for an appointment today to learn about these exciting options!